Hernando County was established on February 27, 1843. Hernando County was briefly renamed Benton County in 1844, the county's name was changed back to Hernando in 1850. Bayport was at one time the county seat. Until 1856 when it was renamed, Brooksville was known as the town of Melendez. The county encompasses approximately 37 miles from east to west, 18 miles from north to south and contains approximately 506 square miles or 323,700 acres more or less. Hernando County is the geographical center of Florida. Approximately 32% of county land is owned by the government. Approximately 24% of the county land is agriculturally classified as Greenbelt. The Hernando County Property Appraiser's Office managed 124,548 parcels made up of 115,578 Real Property parcels and 8,970 Tangible Personal Property accounts. 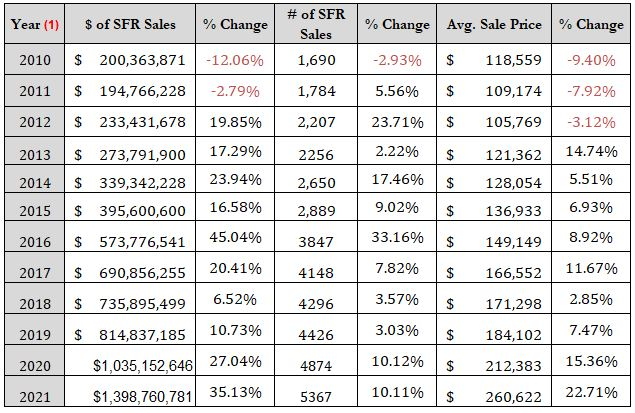 Sales of Single Family homes in 2018 totaled roughly 4,296 with an average sale price of $171,298 up from $166,552 from the prior year. For current up to date estimates of county population and statistics, visit the Planning Department’s demographics data . Section 195.052, Florida Statutes, as amended by the 2008 Florida Legislature (Chapter 2008-197, Laws of Florida) requires that the Department of Revenue and all county property appraisers publish certain county and municipal property tax information on their web sites. This law requires the Department of Revenue to publish on its web sites certain non-voted property tax information for county and municipal governments. Residential real property includes single family residential, real property mobile homes, duplexes, triplexes, other multi-family parcels, residential condominiums and those portions of other types of property which are used as a homestead. (1) The Just Value or Fair Market Value of your property is the amount it could sell for in a competitive open market, assuming that the buyer and seller both acted knowledgeably and without duress. (2) Values obtained from each year's Final Certified Tax Roll unless otherwise noted. (1) Taxable value is the resulting value after all applicable exemptions have been deducted from the Assessed Value of the property. The Taxable Value is what the millage rates are applied to, in order to develop the ad valorem property tax. (1) The Save Our Homes Differential is the difference between the Just/Market Value and the Assessed Value for properties with Homestead. (1) Values obtained from each year's Final Certified Tax Roll unless otherwise noted. (1) Single Family transactions recorded between January 1 and December 31 of each year unless otherwise noted.